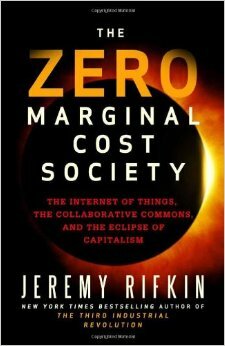 The central message of Jeremy Rifkin, in this important and fascinating book, predicates the demise of capitalism brought about, among other things, by the widespread use of technology, with the amount of human labour contained in each commodity becoming smaller and smaller to ‘almost zero’. Here, Rifkin unconsciously vindicates Karl Marx – who he approvingly quotes, frequently – on the idea that there is a long-term tendency of the rate of profit to decline. However, there is also a number of ‘counteracting tendencies’ which, Marx explains, can and do delay the fall in the rate of profit, sometimes over a lengthy historical period. Indeed, in the current crisis there is a surfeit of profits – a cash mountain – that from the standpoint of the capitalists can presently find no profitable outlet. As a non-Marxist, the author does not approach phenomena – in this case, technology – in an all-sided manner. One trend is emphasised: the colossal effects of technological progress. But Rifkin envisages this developing in a linear fashion. Yet capitalism has never given a finished expression to the economic trends within it, carrying them through to a conclusion. For instance, out of competition can develop monopoly in the domestic market, only for the capitalists to face intensified competition on the world market. Similarly, Rifkin tends to underestimate the ability of capitalism to find a way out, temporarily, from a seemingly hopeless economic situation. It also bears repeating that there is no ‘final crisis’ of capitalism. If the working class fails to seize favourable opportunities to change society, then capitalism, on the bones of the working class – weakening of the labour movement, increased poverty, unemployment, etc – can establish a new unstable equilibrium. The slaughter of value through an economic recession or slump, which to some extent is happening at the present time, creates the conditions for a higher rate of profit, new fields of investment and a new cycle of growth. But then there is the resistance of the working class to a process which will add considerably to the mass unemployment and penury. Moreover, it would be wrong to underestimate the ability of the system to innovate, to create new markets; witness the introduction of mobile phones and the new markets this has created. Whether this will be enough to compensate for the collapse in older industries and the job losses which flow from this is another matter. Despite these qualifications, and our disagreement with some of the conclusions drawn by Rifkin, this is a valuable book which draws attention to the big dangers posed to the working class and its historical achievements. At the same time, we can draw positive conclusions about the future if new technology could be harnessed for the benefit of the majority. The processes described by Rifkin are already well known and are having huge effects on employment prospects in those industries, music for instance, in which the product can be accessed free through the internet. Pop groups and other musicians, as well as the music industry in general, are powerless to prevent this and the ‘compensation’ for their labours now comes from spin-offs, such as gigs and memorabilia. In current conditions, technology is already a ‘jobs killer’ on a monumental scale. Economists like Robert Gordon in the US are predicting that 47% of the jobs in the US, most of them the preserve of the middle class, will disappear in the next few years through the application of new technology. The jobs of teachers and university lecturers are threatened by the mass application of online teaching, as is the architectural profession, and book production, through e-books, with knock-on effects on the book trade, the income of authors, etc. The same goes for the medical profession, with the application of highly sophisticated robots already supplanting nurses and doctors, medical technicians, etc. Nor will this process be restricted to the advanced industrial countries. The US still leads in this field, with robot sales growing by 43% in both the United States and the European Union in 2011. This, Rifkin claims, has moved “the manufacturing sector ever closer to near workless production, or what the industry calls ‘lights out’ production”. China, however, as with most things in the ‘underdeveloped’ world, is also pioneering the widespread application of industrial robots. Up to now foreign capital in China has not invested heavily in robots because of the ready supply of cheap labour. But wages have increased in the coastal provinces, and this has compelled foreign capital to seek cheaper and more profitable sources elsewhere: Cambodia, Laos, Thailand, and untapped cheap labour supplies within China itself. Nonetheless, robotics has also been embraced eagerly. Foxconn, the giant Chinese manufacturer that produces iPhones, is planning to install a million robots in the next few years which will eliminate a large portion of its workforce. Foxconn chief, Terry Gou, was unable to hide his satisfaction at this prospect: “As human beings are also animals, to manage one million animals gives me a headache”. No strikes with robots! Of course, threats to jobs through the application of automation are not a new thing. Even firm capitalist economists – John Maynard Keynes for instance – saw the application of new technology in the 1930s holding out the prospect of reducing the working week to 19 hours. However, the introduction of new technology during the great depression could only add to the problems of capitalism at the time, further increasing the army of unemployed that represented a constant threat to the capitalist system. This was a factor in the technology which existed being held back then and only fully applied during the second world war, but particularly afterwards. This saw a massive boom in new industries, such as rubber, plastics, etc, as a spiralling upswing of production took place. The situation today is more analogous with the 1930s than the colossal boom of 1950-75. During the post-war period, particularly the 1950s and 1960s, capitalism was able to harness massively the advances in technique and technology in the greatest boom the world had seen. We are now, however, in an entirely changed situation, which Rifkin is aware of and provides copious details set out in an impressive fashion. Now, costs have tumbled and this will accelerate further. For the last few decades, the fear of new technological developments, combined with the outsourcing of jobs to places like China, has been a feature of the discussion about whether there was any future for manufacturing in the advanced industrial countries. Yet, while many industries and jobs relocated to China, leading to significant deindustrialisation throughout the ‘advanced’ capitalist world, the number of workers employed in manufacturing has remained pretty steady taken from a global point of view. That has now changed with the added threat to jobs posed by mass robotics. And it is not just posed for large-scale industry. Rogue landlords, the Independent reported recently, were proposing to fly drones with cameras installed over the rooftops of properties in order to assess whether repairs were needed, no doubt threatening the jobs of roofers! Even the Financial Times has ruminated on the big threat posed by robots, running stories to the effect that ‘we have to get the robots before they get us’. Rifkin argues that, if the current rate of technology displacement in the manufacturing sector continues – and he expects this can only accelerate – factory employment, “which accounted for 163 million jobs in 2003, is likely to be just a few million by 2040, marking the end of mass factory labour in the world”. To be replaced by what? The capitalists have no answer to this as they have no solution to the current world economic crisis. It was Karl Marx, together with Friedrich Engels, who first understood and revealed the colossal revolutionising effect of capitalism through the introduction of technology which, in turn, could lay the basis, for the first time in history, for the abolition of ‘want’ throughout the world. Limitless possibilities for humankind would flow from this. This, of course, was on condition that socialist revolution would eliminate the impediments to further progress: capitalist private ownership of industry and society, on the one hand, with the nation state, on the other. Rifkin repeats Marx when he traces the process of capitalism, initially developing a “competitive, free market”. Out of this develops the tendency to eliminate competition through the establishment of a monopoly or oligopoly. Once having established a dominant position, the inclination of the capitalists to bring in new labour-saving technologies, to advance productivity and reduce prices, is held back as the monopolists attempt to keep prices artificially high. All of this has been confirmed by the history of capitalism up to now. Yet, as Rifkin points out, new, initially small, capitalist outfits can establish a niche from which they can loosen, overhaul and then often eliminate the former grip of the monopolists. However, this process, repeated again and again, leads to the inevitable creation of new monopolies. But these processes are not carried through to a conclusion of complete monopoly. Monopoly can exist on a national level but can then be undermined by economic rivals with a ‘greater share’ of the world market. The same applies to the holding back of the use of technology, as was the case in the 1930s. Rifkin gives some very good examples of how monopolies are promoted even by the apostles of the ‘free market’. For instance, former US treasury secretary Lawrence Summers, together with economist J Bradford DeLong, commenting on the emerging data processing and communication technologies, opposed government intervention, in general, but favoured short-term ‘natural monopolies’. They argued that “temporary monopoly power and profits are the reward needed to spur private enterprise to engage in such innovation”. Rifkin comments that in “an incredible admission”, the two acknowledged that “the right way to think about this complex set of issues is not clear, but it is clear that the competitive paradigm cannot be fully appropriate… but we do not yet know what the right replacement paradigm will be”. Rifkin envisages a new “third industrial revolution”, which has developed out of the second industrial revolution at the end of the 19th and the beginning of the 20th centuries, and is already under way. The discovery of energy resources, particularly oil, the invention of the internal combustion engine, and the introduction of the telephone gave rise to a new communication/energy complex that came to dominate the 20th century. However, Rifkin’s economic case seems to have been bolstered, particularly by the incredible development of 3D computers, which has opened up “limitless possibilities”. 3D printing allows the possibility for machines to reproduce themselves. It sounds like science fiction but is a reality! This is a vital component of what the author calls “the Third Industrial Revolution manufacturing model”. He claims this is “growing exponentially along with the other components of the Internet of Things infrastructure”. 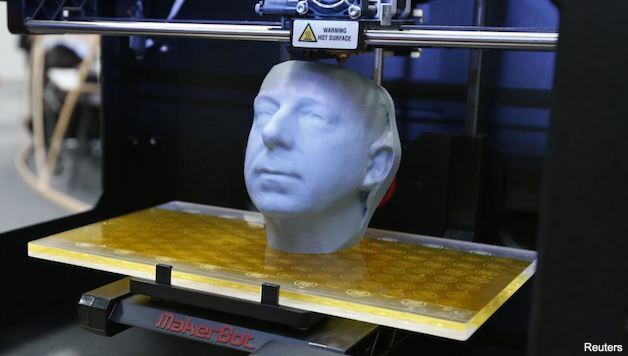 3D printers are already producing products from jewellery and aeroplane parts to human prostheses. They can print their own spare parts without having to invest in expensive retooling and the time delays that go with this. This development is rooted in ‘sustainable production’. This will indeed be a kind of revolution, but not one led by the working class and its allies, argues Rifkin. Socialism is not his alternative but something in between. Here, he betrays his roots as the son of a small entrepreneurial businessman who always looked to increase production and technique rather than speaking about ‘profit’. He sees the inadequacies of big business but does not see the potential power of the working class and the poor. We are expected to believe that, through a protracted process, a long drawn-out peaceful competition between a dying system, capitalism, and what he and others describe as “the collaborative Commons”, the latter will win out. This would be a hybrid system involving a burgeoning collaboration, which is already taking place, between peoples, cooperatives, small green enterprises, etc, and which seeks to embrace the ‘best features’ of the ‘market’, capitalism. This will gradually supplant capitalism. This perspective, as the author admits, does not envisage going beyond Mahatma Gandhi’s swadeshi concept, described by Gandhi as “mass production certainly, but not based on force… It is mass production but mass production in people’s own homes”. This is an unrealistic goal for replacing the ‘gigantism’ of capitalism by turning back the wheel of history to a certain localism and petty production. His schema apes the forms of production which predated capitalism proper, in the modern sense of the term, relying on small-scale scattered producers with goods collected by overseers or capitalists and usually accompanied with intense overwork, sometimes of whole families. Witness the situation in India today as small producers, the small farmers, are unable to compete with an increasingly monopolised economy. The result is mass suicides of farmers in protest at being crushed by debt; worldwide there are 800,000 suicides each year, undoubtedly reflecting the catastrophic social consequences of capitalism. Despite the utopian character of most of his alternatives, Rifkin produces here a fascinating tour de force on the implications of technology and the need to harness them in a peaceful and progressive fashion for the benefit of humanity as a whole. In fact, the evidence is so crushing against ‘modern’ capitalism’s incapacity to utilise its own creations that this book, in all fairness, should be called ‘the invading socialist revolution’ but for the fact that Rifkin rejects socialism as an alternative. This phrase was used by Engels to describe the process of ‘statisation’ in the late 19th century – the nationalisation of individual industries – that indicated the failure of capitalism and heralded the socialist future. Yet Rifkin unconsciously recognises the favourable conditions for socialism, and some of the forces that can make this happen. Although he does not state this, he is dissuaded from drawing this conclusion because of the terrible heritage of Stalinism. But a repeat of a top-down, bureaucratic-dominated society is not possible in the highly-educated, culturally advanced society we have today, particularly in the US. Correctly, he states: “While the collaboratists [in reality, opponents of capitalism] are ascendant, the capitalists are split”. He also highlights favourably the anti-WTO movement in Seattle in 1999 that prepared the way for the Occupy movement. This led, in turn, to the election victory of Kshama Sawant, the first socialist councillor in Seattle in 100 years. This new generation, whose political outlook was taking shape even before the onset of the present devastating crisis, their generosity of spirit and solidarity with the oppressed, has obviously had a profound effect on Rifkin and others, and is reflected in many of the observations he makes. However, how can this ‘democratisation of everything’ really be carried out while capitalism, with colossal giant monopolies dominating with their economies of scale, is left intact? Rifkin deals at length, for instance, with the internet and ‘the internet of things’, at the same time emphasising the approach of the new generation of scientists who freely distribute and share their latest discoveries with fellow scientists without first of all seeking financial rewards. This is in marked contrast to Big Pharma which only invests and promotes products if there is profit in it. There were no great gains to be made by inventing an antidote to the Ebola virus because, initially, it mostly affected poor people and nations. That is now changing as the current epidemic threatens the advanced world. Rifkin denounces inequality and highlights what even capitalist journals have recently recognised: that where class divisions expressed by income are starker than in other countries, there is greater resentment and class opposition. In London, there are more so-called ‘ultrahigh net worth individuals’ per head than anywhere else on the planet. They are defined as people with £21 million or more in assets apart from their main home. London has overtaken Hong Kong as the most expensive city in the world, and this is against the background of falling incomes for the great mass of British people, skyrocketing rents and mortgages, and falling wages. Rifkin also agrees with socialists that we can build a society – a “sustainable cornucopia”, to use his phrase – not just of abundance but of superabundance if all the resources of society were utilised for the common good. However, he recognises the decline that has set in even among the middle class: “The United States… [had] the most robust middle class in the world in 1960… By 2012, the United States had the ignominious distinction of being ranked 28 out of 30 in the OECD countries in income disparity – the gap between the rich and poor – bettering only Mexico and Turkey”. How to change this situation to the benefit of the vast majority of working people and even the middle class? Rifkin’s solution is to change society through argument and force of example – effectively, “behind the backs of society”, as Marx commented in relation to the great socialist utopians such as Robert Owen. This is shown when he addresses his final remarks to those “ensconced in the heart of the capitalist system who fear that an approaching society of nearly zero marginal cost will spell their own ruin”. He seeks to assuage them by pointing out that the average lifespan of a Fortune 500 company is only around 30 years. This amounts to him seeking to convince the fearful capitalists to calmly accept their own demise. It will not work with the big capitalists. A past British Labour leader, George Brown, was more realistic when he stated: “No privileged group disappears from the scene of history without a struggle, usually without any holds barred”. The capitalists will not calmly accept their fate, making way for the likes of Rifkin with what amounts to a ‘middle way’ between the capitalists, on the one side, and the mobilised mass ranks of the working class, on the other. However, it is possible and even likely that there will be splits within the ruling class, with the more intelligent and farsighted recognising the blind alley of their system and looking towards a new system that can take society forward. This particularly applies to the younger layers, university students freed from parental control, who can embrace Marxism. However, for this to be sustained, it requires not just a critique of capitalism – which Rifkin has, in a way – but also setting out in a clear way the alternative of socialism, and building the force to achieve it: a mass party with a farsighted leadership. The capitalists’ power and wealth, their ownership of the means of production and the control of society, will have to be taken away from them through a mass movement. The idea that the opposition to the capitalists will be able to utilise the internet indefinitely, with complete freedom to undermine capitalism, is already contradicted by the encroachments which the capitalists and states have made upon this ‘free resource’. Witness the muzzle which has been placed on the internet in China, Turkey, etc. There is much in this book which is useful, indeed admirable. It points to the huge economic danger of new technology for the working class but also for the capitalists. It threatens to provoke a mass revolt, the outlines of which we can see in Scotland, Britain and throughout southern Europe in what amounts to a mass uprising of the working class and the consequences of a failing and diseased system. In this situation, the new ‘Luddites’ are not the working class but capitalism – whose historians distorted the views of the original Luddites. The capitalist system cannot fully utilise the huge potential benefits flowing from the latest developments in technique. Only a planned economy leading to democratic socialism on a national and international scale can do this and, in the process, satisfy the yearning of those, like Jeremy Rifkin and the new generation, for real change.